This product has been discontinued. 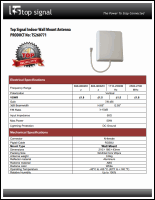 For a replacement, please see the Top Signal 4G Compact Indoor Panel Antenna TS260782. 8.27 × 7.09 × 1.69‑inch directional building antenna. Mounts to drywall or other drillable, vertical surface (mounting bracket included). Beamwidth, 698–2700 MHz: 60–70° horizontal, 55–45° vertical. Works with WilsonPro 50‑ohm commercial systems and weBoost Connect 4G‑X kits. May be concealed with Wilson 901123 in‑wall recessed mount for indoor panel antennas.